From the staff at AAP: As a member of the American Academy of Pediatrics (AAP) Library Advisory Board, Basia Delawska-Elliott shares how her organization disseminates information about new resources across a multistate hospital system. We are grateful to our Advisory Board members for sharing their expertise with us to further our efforts to publish content supporting pediatric patient care and research. Such resources include AAP’s NRP eBook Collection (as mentioned in the article below) and Pediatric Care Online (PCO) – a comprehensive point-of-care platform. Q (AAP): How do you communicate new resources to physicians and residents? A (Delawska-Elliott): Providence St. Joseph Health (PSJH) is a large and complex health system with 51 hospitals, clinics, and long-term care facilities spanning across six states with close to 110,000 employees and staff. Sharing information about new resources or services can be a challenge, especially since the four legacy systems now comprising PSJH still use different IT platforms and individual sites or regions have separate intranets. To assure that all staff are aware of new resources, we announce big purchases with global applications through a marketing blast in local newsletters or directly to distribution lists. Smaller, more targeted purchases or resources recommended by patrons are announced directly to the specific groups of users or departments that are most likely to use them. Although we are a virtual team, we have stationary libraries and local library staff. We have been working very hard to maintain that personal touch and local feel that so many patrons cherish in their library contacts and that helps us know and serve our patrons better. In our marketing we rely heavily on the local teams in helping us disseminate information and answer questions about new resources. Q: How do you guide users to integrate the resource into their daily practice/patient care? A: To guide users we provide step-by-step instructions on how to access the new resources and a brief description of how they can be helpful to our users’ practice. 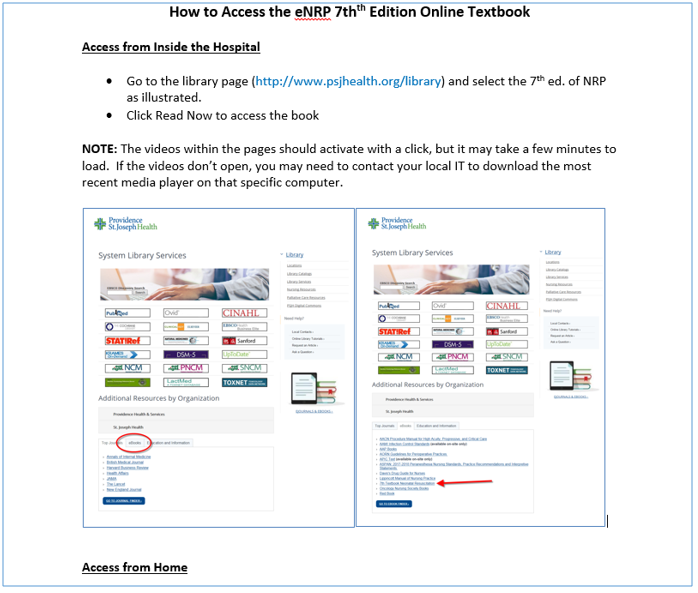 I have included an example of our NRP handout (Neonatal Resuscitation Program eBook Collection from AAP). As readers can see, it is a simple, highly visual document, which makes it easy for a patron to find and access the book instantly. The instructions were originally created and sent out when we purchased the title and they have been updated several times since to reflect changes in access and changes in the layout of the library page. However, the initial launch is not the only time we promote resources. Since we are a virtual team, we like to go out to our patrons by doing extensive outreach. Library staff present library resources and services and provide information literacy instruction to specific groups of stakeholders in person and virtually. Those groups include administration, clinicians, researchers, faculty, residents, and students. For the presentations we create targeted documents highlighting pertinent resources. The outreach sessions allow us not only to present new resources, but also to learn about the current and future needs of our patrons. An ongoing dialogue with our users informs our collection development decisions and organizational updates to the library portal. I have included an example of a slide from our recent presentation to a regional perinatal/neonatal nursing group. The slide contains information about databases, collections, individual resources, and links to automatic searches in our journals and ebooks aggregator. 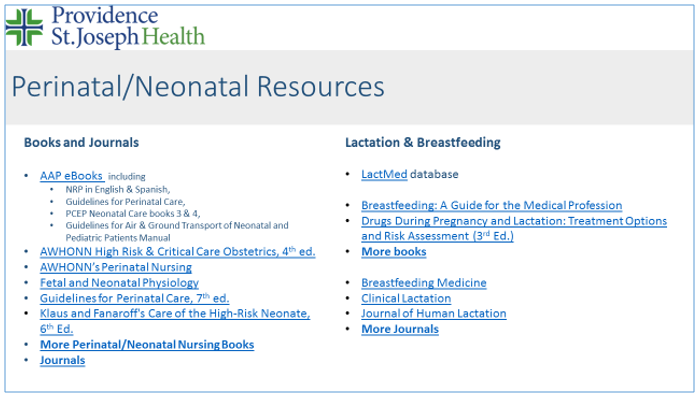 Other slides included in this presentation had information on, and links to, drug resources and nursing resources from other specialties that might be useful to perinatal/neonatal nurses. Q: What is your time frame to announce the new product? A: Our goal is always to announce new resources as soon as they go live. Q: How do you judge a campaign’s success? A: We don’t have a standard metric of campaign success. Typically, we receive excited messages from our patrons as soon as we announce a new resource. The respondents tend to be library champions and superusers, who further the campaign by sharing the news with their colleagues. As word of mouth is often still the best marketing strategy, we are grateful for their enthusiasm. And while we don’t formally evaluate the campaign beyond the initial launch, we do monitor usage and send targeted follow-up announcements as needed. The Providence St. Joseph Health library is committed to our community and we believe that marketing resources, just like purchasing resources, is about meeting our patrons’ needs and not about selling. This commitment informs our marketing strategy and guides our engagement with our users.